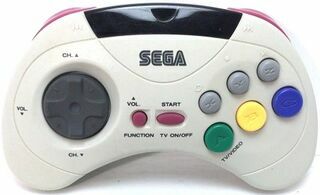 The Saturn Infrared Control Pad, known as the Cordless Pad (コードレスパッドセット) in Japan, is a special type of Sega Saturn control pad, which rather than rely on leads communicates with a Sega Saturn through infrared light (much like most television remotes). The Infrared Control Pad requires both of the Sega Saturn's control ports. It was sold as a bundle (containing a controller and a receiver), though it was also possible to purchase controllers and receivers separately. The peripheral was not sold in North America.